Paulson DK5-X.250AF Anti-Fog Face Shield System for PASGT (.250" thick) FREE SHIPPING! During a riot, a regular face mask does not always offer full-facial coverage. The heavy, quarter-inch gauge of Paulson's Anti-Fog Face Shield System offers greater peace of mind in riot or other aggressive field and tactical conditions. A universal fit guarantees the item is compatible with multiple helmets with integrated front peaks (not included) and still seals at the top to provide protection from liquid intrusion. Both left-handed and right-handed users can customize the pivot and lock features for effortless one-handed operation with their dominant hand. Either hand can be used to lock the shield open or closed at any time for instant use or compact storage. 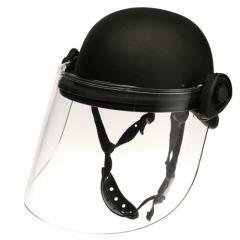 ©2002-2019 CopsPlus.com: Paulson DK5-X.250AF Anti-Fog Face Shield System for PASGT (.250" thick) FREE SHIPPING!